Owen Geiger has created many house plans, and Kelly Hart has created some as well. Many of these plans can be found here under the Plans menu. Kelly has a site called dreamgreenhomes.com which has plans from an increasing number of green designers, including himself and Owen. Here is a page with profiles of the architects and designers and links to their plans on that site. True or False? In colder regions plumbing will freeze if it’s on an outside wall. If plumbing is outside the insulated envelope of the house it is certainly vulnerable to freezing. What would be a fair price for floor plans to include electrical plumbing etc. We cannot supply the electrical or plumbing schematics for these plans. Usually an experienced electrician or plumber can do this fairly easily. Owen gracias por las publicaciones. Soy nativa de CR. Y me encanta el empeño que le han puesto para fomentar este típo de construcción y de conciencia. Soy de zona sur. Hace años hice un curso de construcción en barro y claro es alucinante. Tengo ya finalidad de hacerme mi choza así que voy a documentarme con lo que posteas. Tengo una consulta tonta. Los sacos al ser llenados al tope son doblados y colocados para abajo correcto? Y los andamios con tubo de 2″ para ayudar a curvar se hacen en sitio correcto? Cualquier cosa te molesto . Pura vida!!! 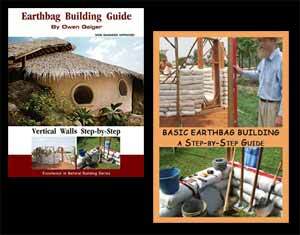 What earthbag home plan can be built the quickest? Is it realistic to aim at finishing an earthbag home in two weeks with 2-3 people working on it? Would the thin wall earthbag building technique make this possible for a 400-600 square foot home? First of all, two weeks is not a very realistic time frame for building a home even with a lot of building experience. Do you have to clear and prepare the building site? Raise and level the building site for proper drainage? Dig a rubble trench? Dig water lines? If so then you already have a lot of work to do just to get started. A house is a big investment. Do it correctly and it can last several lifetimes. Thin wall earthbag with posts every few feet is very fast. But you’ll need to think and plan every step carefully. Ex: rent a post hole digger and set the posts in post hole dry mix concrete that sets up in the hole. Use a gravel bag foundation. Use insulating fill in upper tubes. Use factory made trusses that sit on a wood bond beam. Possibly hire some out of work carpenters to help get the roof on. Thanks so much for the helpful info! I’ve been looking into thin wall earthbag building to make the process faster. Do you know if the long bags could be made thicker to provide lots of insulation and soundproofing on the inside of the house? You can buy poly tubing in various widths. The standard width for earthbag building is 18″. I’d use 10″-12″ width for thin wall designs. Insulation typically goes on the exterior of thermal mass walls such as earthbags. This is the most efficient way to maintain steady temperatures in the home and save energy. Use interior plasters that enhance acoustics: earth plaster, gypsum/perlite plaster, lime, etc. Plus use lots of throw rugs, wall hangings, etc. Only the most popular plans are listed on Dream Green Homes. Leave a note when ordering if the plan you want isn’t listed and I’ll make sure you get the right one. Hello! I was wondering how to reach you guys! I have picked a home design on your site, but altered it in a few ways to suit us, but we need a set of actual plans…can you help us figure any of this out? It is the Torus design. I have not been able to find contact information here… Our new land is a hundred feet deep with red then gray clay, so awesome, and with madrone and fir everywhere. We have water and will have solar, as well… I can give more info, but can you assist us, at all? Our contact info is at the top of every page. I no longer do custom plans, so I suggest buying the CAD files and getting a local designer modify them just the way you want. Thanks for writing. What we talk about here is perfect for Pakistan. At least one other reader is building this way in Pakistan. Almost everything is free on our blogs and websites. We have over 2,000 pages of content now (maybe closer to 3,000 pages now). See the links on the right side of the page to visit our other sites. It’s up to readers to search or browse the information to find what they need. There is no “membership”. You can subscribe to the blog if you want by clicking the Subscribe button. In the next year or so (After making my transition from full time student to working RN) I plan on getting some land. After drilling for water I was trying to decide between building a small earthbag place to sleep in until we can build the big house (Also earthbag), or (Crazy idea) put up a yurt and build up an earthbag wall around the outside of it to provide some good protection and then plaster it. Either way we would probably either be living in a tent or super cheap RV (1-2k) until we can build. What are your thoughts on this? Some type of temporary shelter is good so you can spend more time on-site. Ideally it can later be used for storage, a guest house, etc. Stacking bags around a yurt: How will the roof drain? You need to protect the earthbag walls. You don’t want water draining behind the wall. Strawbale structures are much faster than earthbags. That would be my preference for temporary structures. For instance, you could stack bales in a circle and put a yurt roof on top. You’d save money and time. Raise the bales on 2-3 courses of gravel bags. Add baling twine or straps that go under and over the bales to hold down the roof. You can easily curve the bales slightly by stepping on them with one end raised on a log. Plaster the bales with cement plaster immediately so they don’t get rained on. How can I purchase the book and DVDs? In using all natural materials sand and shells form a natural pressed material,that is durablable. against them.its all the same method just less bags. Sorry, what you’re describing is not clear to me. At the top of the root cellar I would still have to use some earthbags. Before putting on the roof. I have read where on a natural floor to use turpentine. Then put down serveral layers of some type of harder. Ok can this same technique be used on the wall of the root cellar. And adding some type of plaster to the walls for extra hold &/or strength to the walls? But you said you didn’t want to use earthbags, so I’m not sure what you mean. What is the primary building method you’re trying to describe? Yes plaster. My apologies. I want to build the root cell.what I was thinking why cant you just plaster(with a hardner) the walls and floor instead of using earthbag? I know you can on the floors so not the walls? What your saying is not clear. It could mean different things. Are you talking about ferrocement? Cement cast in forms? Something else? On your plans on the root cellar, can you just smooth the walls & just use pasture with a harder? Rather than using the earthbags It would be the same as a you would on a nature floor would not? I’m not sure what you mean. Is “pasture” = plaster?